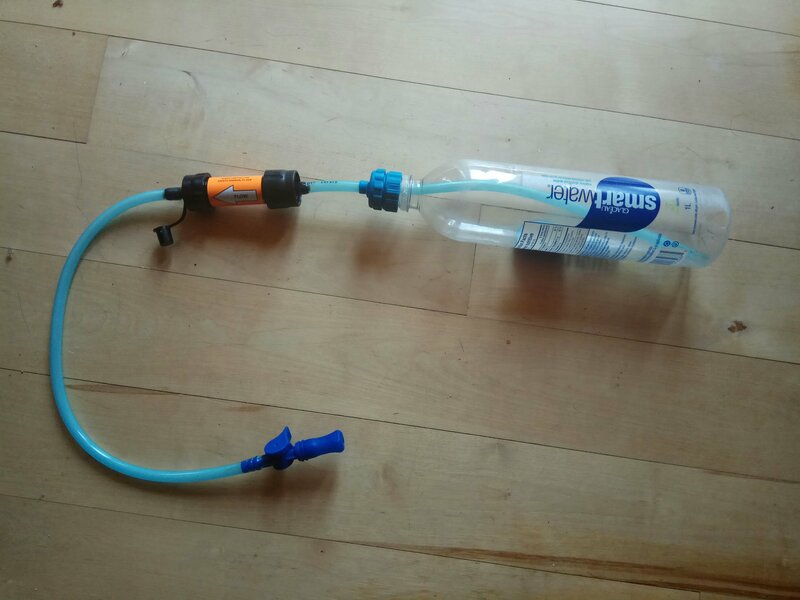 I measured the tubing so the portion in the bottle would fit in both my 1L Platypus and my 1L SmartWater bottle (used and recommended because it is super light and the shape fits very nicely in packs, as well as durability), all the way to the bottom. I then left a small amount to go through the bottle cap thread connector, and made my cut there. The tubing fit easily over my Sawyer Mini, on the “dirty” side, and then I shortened the tube so that the distance from the Sawyer Mini to my mouth was reasonable (it’s a bit too long to start). The mouth piece side of the tube slid easily but firmly over the Sawyer Mini clean side. The beauty of this set up, is the ease of just grabbing “dirty” water and continuing on. The suction through the Sawyer mini is perfectly fine and sipping water has no issues. Removing the hoses from the Sawyer Mini can be a tad challenging (I use the non sharp side of the knife to pry it down). Fortunately, if you keep your water sources choosy, you shouldn’t need to back flush too often. I have tried it now on a couple weekend hikes and day hikes with no issues. I will be taking this setup with me on a 10-14 day trip to really test it out.